Discover a restaurant that boasts a high-class atmosphere inside a classy Lake Geneva resort. 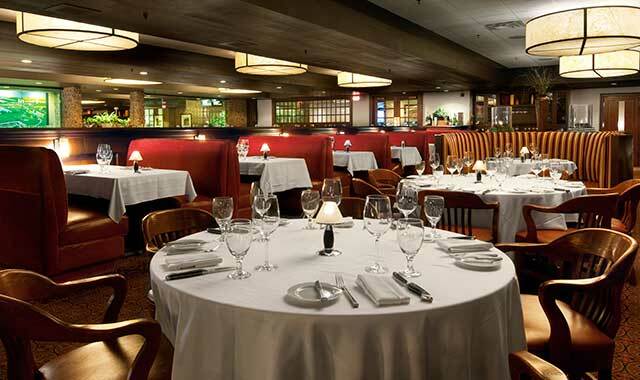 The main dining room at Geneva ChopHouse is stylish and classy. A wall of windows (at left) reveals grand views of the resort property. When it comes to fine dining, the Geneva ChopHouse is one of the premier restaurants in the region. Located within the upscale Grand Geneva Resort & Spa, 7020 Grand Geneva Way, Lake Geneva, the ChopHouse provides guests with a memorable dining experience, offering classic menu selections, breathtaking views of the Wisconsin countryside, and overlooking the 18th hole of the famed Brute golf course, one of two championship courses at the resort. Guests can also enjoy the scenery from the outdoor Embers Terrace, so named because of its seating arrangements around a smoke-free fire pit. The Geneva ChopHouse is part of the Marcus Corporation, which owns similar ChopHouse restaurants in Milwaukee, Madison and Bloomington, Minn. “It’s not just a destination,” Sawin says. “We have local guests who dine here, as well as guests from as far away as Chicago.” While reservations are preferred, the restaurant typically seats an additional 50 to 70 walkup guests on Friday and Saturday nights. First-time visitors will be impressed with the atmosphere of this restaurant, which opened at Grand Geneva nine years ago. The ChopHouse seats 140 and features floor-to-ceiling windows plus an open-air kitchen, allowing guests to view the chef and his staff preparing dishes. The Chef’s Table, located near the kitchen, is popular with many guests, as is a private dining room that accommodates up to 30 guests. Sawin describes the ChopHouse as a neo-modern design. “It possesses the classiness of a 1960s or 1970s restaurant,” he says. The ChopHouse is known for its variety of choice cuts of steak. Customer favorites include an 8-ounce fillet, a tender 18-ounce bone-in rib-eye and a 24-ounce porterhouse steak. “We have a special seasoned blend that we put on each piece of meat, and then we finish each steak with fresh herb butter, which really tops it off,” Sawin says. For seafood lovers, choices include a 12-ounce lobster tail or sea bass served with sun-dried tomatoes, spinach and basil pesto. There’s also a sampler platter that includes an assortment of crab legs, lobster, tuna, oysters and shrimp cocktail. Another crowd favorite is the “Trio of Sides.” Guests can compose a custom meal from a variety of side dishes, including lobster mac ‘n’ cheese, creamed spinach, garlic mashed potatoes, creamed corn or grilled asparagus. “People like it because of its simple presentation,” says Sawin. To complement their meals, diners can choose from an extensive wine list of nearly 100 vintages, both domestic and imported, or take advantage of a full-service bar with a variety of beers, soft drinks and mixed drinks. Those with a sweet tooth will want to save room for the ChopHouse Sampler – generous portions of carrot cake, double chocolate cake, creme brulee and Key lime cheesecake. The popular Sunday brunch features many local products, including sausage and turkey delivered from nearby farms. Loaves of bread are made daily at a bakery in downtown Lake Geneva. The restaurant offers special menus for holidays like Valentine’s Day, and accommodates private events including business meetings and wedding dinners. ChopHouse recipes, such as lobster mac ‘n’ cheese, are available online at chophouse411.com. For Sawin, however, it all comes down to providing guests with a memorable dining experience. That’s why the chef is seldom sitting in his office. He’s more likely to be found working the prep lines or greeting guests in the restaurant. The Geneva ChopHouse is open for dinner, Mon.-Sun. 5:30-10 p.m., and Sunday Brunch 10 a.m.-2 p.m. Reservations are recommended. This entry was posted on Friday, April 12th, 2013 at 11:59 am	and is filed under Dining Guide. You can follow any responses to this entry through the RSS 2.0 feed. Both comments and pings are currently closed.